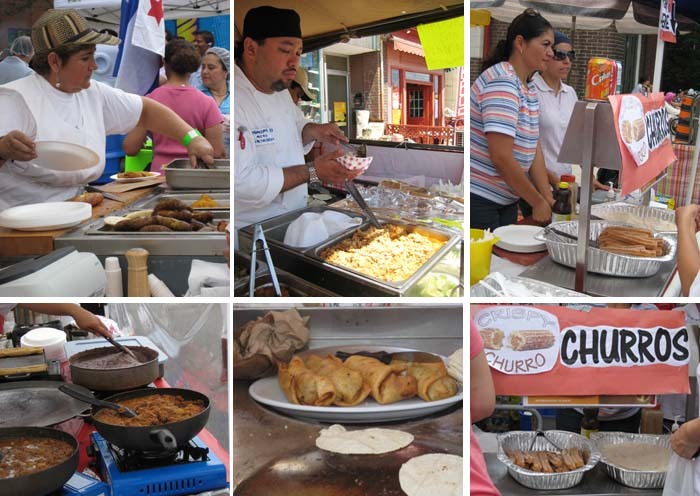 Yesterday was the last day of summer, and today marks the official start of autumn (Torontonians call it Fall). The good times always fly much quicker than any other time, isn’t it? Strangely, the weather for the last few days have been beautiful – sunny everyday, about 20-23 degree celcius each day. Though not good enough for a swim or a tan at the beach, it is definitely perfect for a cup of warm coffee at the patio. At least, this is the right temperature I like. By the camp fire. I was already in my PJ ! It is (still) summer here ! During summer, everyone goes to camp. Well, if you don’t do it now, you may not have any other time for the rest of the year. 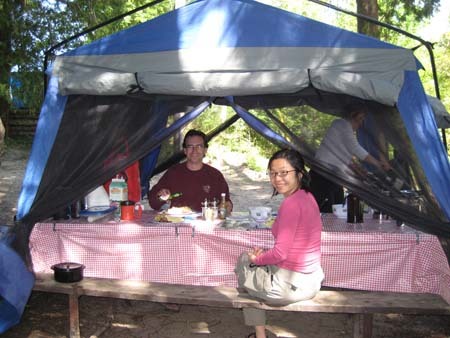 Friends of ours have been camping in Sandbanks Provincial Park for the last 5 to 6 years. Being the only rare time that is ‘practical’ for camping, DM has to book at least 6 months ahead, and have to wake up at 7am to go online for the booking. Yup, it is that popular here. 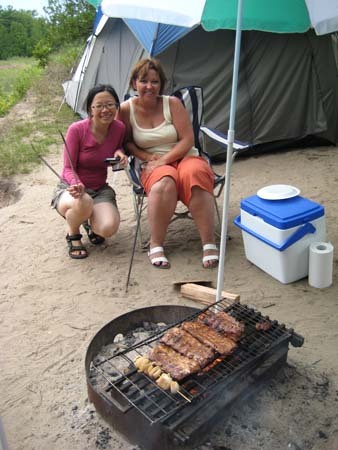 This year, it is no difference, DM and LM have booked for a week long camping in Sandbanks Provincial Park. Ed being cheeky, he takes the advantages of letting them to do the hard work (booking), and we joined them for a couple of days during that week. 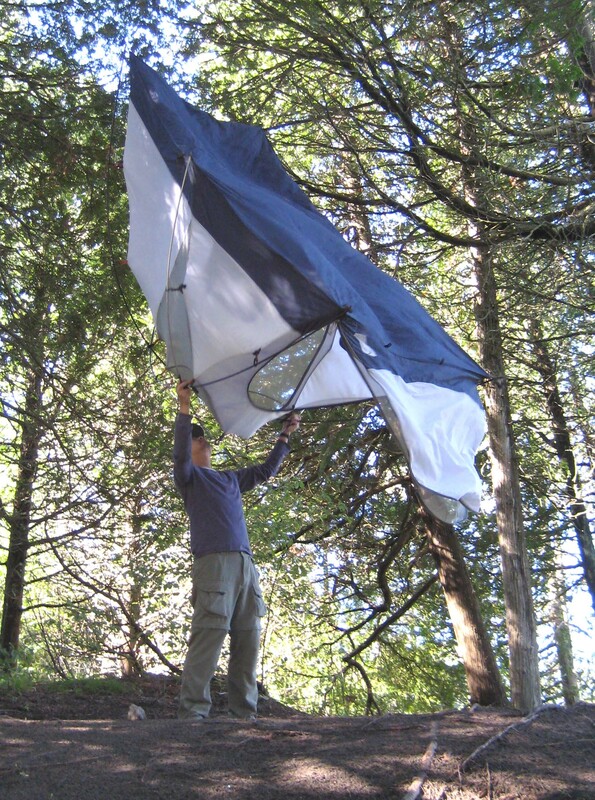 So, we went last weekend – DM and LM’s last two days at the camp site. Unfortunately, the forecast was not great at all. Yet, we still went because we have not been out of the city since I came back. Tired of city life and needing a nature dose, we packed and soldiered on. Sandbanks Provincial Park is only about 2.5 hours from Toronto. We arrived on Friday night. 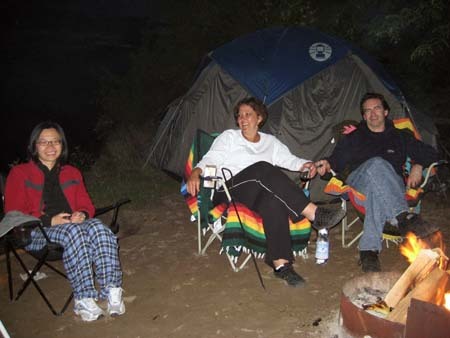 After setting up the tent, we finished our day with a few glasses of wine with DM and LM by the camp fire. 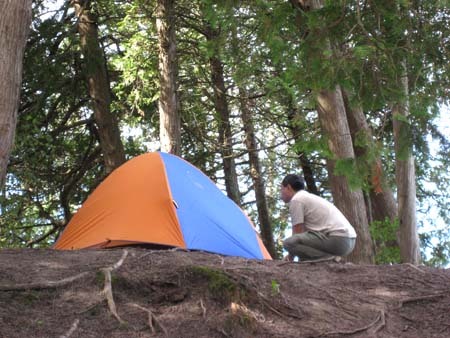 Was the tent sturdy enough for the rain storm? The next day, supposed to rain, instead we had a gorgeous weather. They took me this newbie to the famous sand dunes. 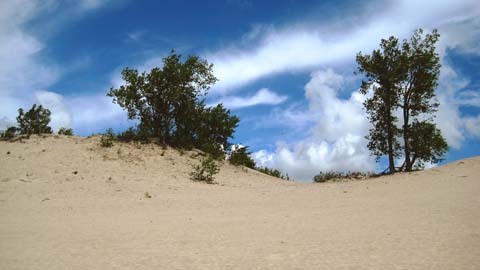 Some dunes are as tall as 50-60 feet. Never saw giant sand dunes before, I was amazed. We were lucky that the day was not too hot and had constant refreshing breezes. Hence, I survived well with the climbing of giant sand dunes. However, imaging myself going to Sahara dessert (one of my many wild dreams) climbing even larger sand dunes under the fierce sun, does not excite me like before anymore. 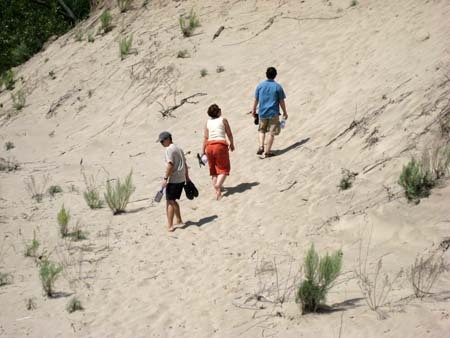 After visiting the sand dunes, we thought we deserved more sands, and some relaxing times. We went to a beach within the Park. Weather surprisingly was holding up for us. LM and I read, Ed and DM went for a swim. Knowing there would be a rain storm coming overnight. We did not stay at the beach too long. We went back to our camp, cooked a big feast (BBQ ribs, steak, BBQ corn and other veggies) and tried to enjoy more wines and camp fire before the storm. At about 10pm, we could see lightning lightening up the sky somewhere far from us . Slowly, the lightning is moving closer to us and we knew up it was time to pack up and hide in our tents as quickly as possible. It was my first time to camp in a storm. The frequency of strong lightning, the powerful wind and the amount of rain above our tent were not funny. We camped under the trees and I was worried what would happen if the trees struck by the lightning. ‘If it happened we would be dead.’ Ed said. Yup, he likes to do that to me. No matter how worried I was, after a full day of activities, I still slept sound. I woke up by the singing of the birds next morning. Everything was wet and soaked. We quickly had our breakfast, then cleaned up, and went home with lots of sands in our wet tents and in our shoes. It is indeed a real experience with the nature.